CPNP offers 35 hours of ACPE-accredited recertification activities each year. If you do not need BCPP recertification credit, you can still earn ACPE credit while benefiting from the targeted focus and high quality of the BCPP recertification programming. Access to the exams ends on December 31, 2019. 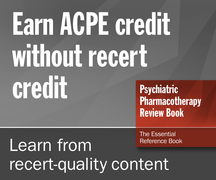 The most popular ACPE-only option is to purchase the Psychiatric Pharmacotherapy Review Book with credit. You can earn the credit in smaller pieces and on a longer timeline than the recertification course. If you are interested in purchasing ACPE credit by module from the Review Course, please scroll down to the list of courses below. Login (or create a FREE account) to purchase the book! Members can access related products for as little as $175. Sign in or join now! Get help choosing the right option for you. If you have an account with CPNP.org, please log in before attempting to register. By logging in, the system can help you make informed selections based on credits currently on your transcript. This self-study course is designed to assist the learner in developing and maintaining contemporary knowledge and skills in the pharmacotherapy management of anxiety disorders. Content includes a comprehensive outline focused on etiology, risk factors, pathophysiology and treatment of anxiety disorders. Specific focus is placed on identifying common signs and symptoms based on DSM-5 criteria, resolving drug therapy problems and developing an appropriate monitoring plan. This self-study course is designed to assist the learner in selecting and evaluating sources for biomedical information appropriate for psychiatric pharmacy practice. Content includes a comprehensive outline with focus on how to critically evaluate a study with regard to design and methodology, sources of bias, and significance and applicability of findings. This self-study course is designed to assist the learner in developing and maintaining contemporary knowledge and skills in the pharmacotherapy management of bipolar disorder. Content includes a comprehensive outline focused on etiology, risk factors, pathophysiology and treatment of bipolar disorder. Specific focus is placed on identifying common signs and symptoms based on DSM-5 criteria, resolving drug therapy problems and developing an appropriate monitoring plan. This self-study course is designed to assist the learner in developing and maintaining contemporary knowledge and skills in the pharmacotherapy management of depression. Content includes a comprehensive outline focused on etiology, risk factors, pathophysiology and treatment of depression. Specific focus is placed on identifying common signs and symptoms based on DSM-5 criteria, resolving drug therapy problems and developing an appropriate monitoring plan. This self-study course focuses on understanding and interpreting pharmacoeconomic studies. Using a comprehensive outline, learners will understand the difference between efficacy and effectiveness studies and the different types of pharmacoeconomic studies. Focus will be placed on the different types of outcomes, the features of decision and sensitivity analysis, the key features of meta-analyses and the common statistical analyses included in a meta-analysis. This self-study course is designed to assist the learner in developing and maintaining contemporary knowledge and skills in the pharmacotherapy management of elderly psychiatric issues. Content includes a comprehensive outline focused on etiology, risk factors, pathophysiology and treatment of elderly psychiatric issues. Specific focus is placed on identifying common signs and symptoms based on DSM-5 criteria, resolving drug therapy problems and developing an appropriate monitoring plan. This self-study course is designed to assist the learner in developing and maintaining contemporary knowledge and skills in the pharmacotherapy management of pediatric related diseases. Content includes a comprehensive outline focused on etiology, risk factors, pathophysiology and treatment of pediatric related diseases. Specific focus is placed on identifying common signs and symptoms based on DSM-5 criteria, resolving drug therapy problems and developing an appropriate monitoring plan. This self-study course is designed to assist the learner in developing and maintaining contemporary knowledge and skills in the pharmacotherapy management of neurologic disorders. Content includes a comprehensive outline focused on etiology, risk factors, pathophysiology and treatment of neurologic disorders. Specific focus is placed on identifying common signs and symptoms based on DSM-5 criteria, resolving drug therapy problems and developing an appropriate monitoring plan. This self-study course is designed to assist the learner in developing and maintaining contemporary knowledge and skills in the pharmacotherapy management of personality disorders and eating disorders. Content includes a comprehensive outline focused on etiology, risk factors, pathophysiology and treatment of personality disorders and eating disorders. Specific focus is placed on identifying common signs and symptoms based on DSM-5 criteria, resolving drug therapy problems and developing an appropriate monitoring plan. This self-study course focuses on understanding compliance requirement standards established by national accrediting and regulatory agencies. Content includes a comprehensive outline on topics such as Pharmacy and Therapeutics Committee, formulary management, Medication Use Evaluation, and performance improvement cycles are described. The Joint Commission standards, State Operations Manual F-tags and the roles of IRBs and various governmental agencies are also addressed in this course. This self-study course is designed to assist the learner in developing and maintaining contemporary knowledge and skills in the pharmacotherapy management of schizophrenia and movement disorders. Content includes a comprehensive outline focused on etiology, risk factors, pathophysiology and treatment of schizophrenia and movement disorders. Specific focus is placed on identifying common signs and symptoms based on DSM-5 criteria, resolving drug therapy problems and developing an appropriate monitoring plan. This self-study course is designed to assist the learner in developing and maintaining contemporary knowledge and skills in the pharmacotherapy management of sleep disorders. Content includes a comprehensive outline focused on etiology, risk factors, pathophysiology and treatment of sleep disorders. Specific focus is placed on identifying common signs and symptoms based on DSM-5 criteria, resolving drug therapy problems and developing an appropriate monitoring plan. This self-study course is designed to assist the learner in developing and maintaining contemporary knowledge and skills in the pharmacotherapy management of substance use disorders. Content includes a comprehensive outline focused on etiology, risk factors, pathophysiology and treatment of substance use disorders. Specific focus is placed on identifying common signs and symptoms based on DSM-5 criteria, resolving drug therapy problems and developing an appropriate monitoring plan.